Yeah....I probably should have put a tent over mine! Glad that you enjoyed it. The bread looks good! I'm glad you liked it. I was thinking of adding apples to mine too next time. Yeah, what's up with the "hairy" mango? Still, the bread was good. I made a lot of healthy changes to mine and it still turned out great. Looks yummy, Anne. Mmmm I love the idea of adding walnuts! I LOVE LOVE LOVED this bread! Yours looks great! I also left out the raisins. The walnuts sound like a great addition! I love the idea of using nuts in it. Looks wonderful! The bread looks great! Wish I could have a slice! I think there were a few of us thinking of mango on SNL! So glad everyone loved this, Anne! It looks delicious. We really enjoyed this here too, and I bet that it would be great with nuts! Ohhh looks lovely, and great blog! People were twittering about Mango bread all day yesterday and I couldn't figure out what all if was about. Finally makes sense though! The mango looks great in your bread! And I was giggling a lot remembering the 'Mango' skits from SNL! I'm glad you liked it. Your mango bread looks fabulous. I skipped the raisins too. My son took forever to eat his piece because he was picking out all the strings. I keep finding so many great ideas for other additions. Yum, walnuts sound good. Your pictures look delicious. No, I think of Ze Mango, too! I added walnuts, and the bread was a hit at my house. And I just got a look at your previous post, and those little heart ramekins are so cute! I totally thought of Mango from SNL, too! See my blog :-) Great pics! I thought of SNL, too. While I was making the batter and my husband asked about it, I couldn't resist saying, "You canna have the mango!" Yours looks delish! good substitute for the raisens - a no go for me too! and everyone seems to have come up short on the mango! I added nuts too. I thought it just went with this bread better. 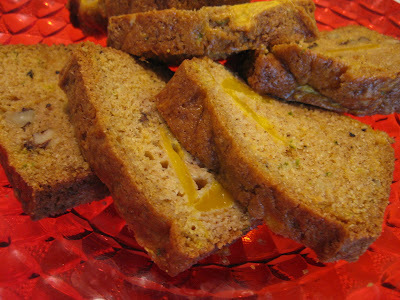 I love the streaks of mango in your bread- so pretty! And about all the butter in next week's recipe- I just bake the full recipe as is and took it to a large gettogether! Everyone raved and I didn't have to deal with all the calories. As I live in mango country, Mexico, I love them. I make mango salsa, chutney, you name it. I was excited about this recipe. Your bread looks delicious. I used slivered almonds and no raisins. There are many varieties and some mangos are not so stringy. The Great Mango Book by Allen Susser is a good resource. This is a keeper recipe for me. Ooooh fun idea to play around with some other fruits! I bet this bread would be fantastic with many things. Yours looks delicious! I loved this recipe. Oh, yeah...I thought of Mango/SNL during the entire making of this recipe. Too funny! It looks wonderful. Yeah for nuts! This bread looks totally delicious! I like that you subbed nuts in place of the raisins...totally a move I would have made as well. So glad you liked this bread so much; I'm definitely craving mango now. Great job. Good call on leaving out the raisins! This looks delicious! Walnuts would taste great in it. Great photos!! Looks delish, Anne! I also passed on the raisins and opted for walnuts. We really liked this one a lot (though I disagreed with Dorie and thought it was better warm from the oven). I actually added minced ginger to mine and it added a little extra kick. Loved the flavor. Took two mangos for the full recipe. I loved Mango on SNL! He was hilarious! :) Glad this turned out so well! I love the platter you served your great looking bread on. It really brings out the bread! Well done. You inspired me to make this yesterday, Anne! 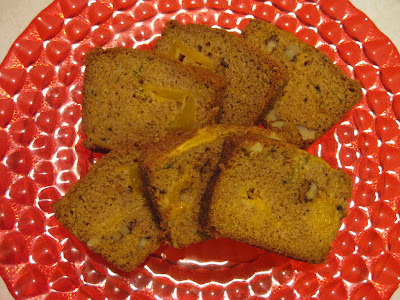 I make a lot of quickbreads for nibbling, and I love mango--but I, too, had never baked with it. I subbed a little bit of King Arthur whole wheat flour--so yummy! My husband was skeptical, but had two slices this morning. Ha! Thanks, Anne! I love how dark and moist yours turned out - gorgeous!